The zombie apocalypse has long been a favorite subject of horror movies, but where would you hide if the undead really roamed the Earth? The question may seem absurd, and yet the U.S. Centers for Disease Control even has its own recommendations for zombie preparedness. And while the agency’s vows to investigate and quarantine an infection provide some comfort, it’s important to have a secure refuge in mind for the worst case scenario. In no particular order, we present to you the pros and cons of 10 real-world hideout options to help you make an informed decision. One of the safest places to be during a zombie apocalypse is underground, and as far as subterranean cities go, Wiltshire’s underground city is a truly impressive example. Built in the 1950s, this 35-acre bunker has the capabilities to sustain 4,000 people for up to 3 months with no assistance from the outside world. The complex was outfitted with offices, laundries, a hospital, cafeterias, kitchens, the second largest phone exchange in Britain, and a television studio, but none of these amenities were ever used. In 2004 the city was decommissioned, and all the water and fuel were drained from its storage tanks. Pros: Assuming you could gather up enough supplies (food, water, and fuel for electricity), waiting out a zombie apocalypse in an underground city would be one of the safest and most sensible strategies. Cons: Underground or not, it’s much harder to secure such a large area, and with more people come more variables. Living in a colony of up to 4,000 other people is not ideal. The more people, the greater the risks. Another good zombie-evading strategy is to assume an elevated position, ideally with a rifle and a 360 degree view of the surrounding area. Lawson Tower, a 153-foot stone water tower in Scituate, Massachusetts, fits the bill. The structure was originally erected as a basic water tower by businessman Thomas Lawson in 1902. When his wife saw it, however, she claimed it had ruined the view of their backyard. So Lawson did what anyone would do: he hired a European architect to design an aesthetically pleasing medieval stone tower surrounding it. Lawson Tower stored water for surrounding towns up until 1988. Pros: Being high above the ground provides a huge tactical advantage, and Lawson Tower comes complete with a crow’s nest and an observation deck. While the water tank is currently empty, if you were able to haul up a supply of water you’d have a perfect place to store it. Cons: The downside of barricading yourself in a tower? No access to provisions, and venturing out for food and water leaves you exposed to possible danger. Also, if a large enough group of flesh-eaters had you surrounded, you’d pretty much be toast. Alcatraz has served many purposes since Julian Workman, the island’s first recorded owner, erected a lighthouse there in 1846: It was the base for the San Francisco arsenal during the civil war, famously housed military and federal prisoners, and today is a popular tourist attraction. With its ample living space, high walls, and island geography, it’s a natural choice for a survivor stronghold during a zombie apocalypse. Another important feature? That 1846 lighthouse still stands, providing a perfect elevated viewpoint of the entire island and any hungry zombies who might be paddling your way. Pros: Well fortified, surrounded by water, with an infamously secure fortress, Alcatraz comes equipped with a wide range of zombie defenses. Its proximity to San Francisco (it’s just 1.5 miles offshore) makes it a convenient rallying point for the surviving populace, but it’s also a liability: the island could easily be inundated or compromised. Cons: Theoretically, the island fortress would be as difficult to get into as it is to get out of. And if a zombie outbreak did occur on the island, you’d be trapped on Alcatraz with a bunch of flesh-eating undead, which sounds like the plot of the scariest horror movie ever. One hundred feet below a charming old farmhouse in Scotland is a tunnel that leads to a 24,000 square-foot bunker that was built to shelter top government officials in case of a nuclear strike. Today it is a cold war museum that houses a collection of military vehicles and a number of questionably accurate historical artifacts. Cons: For all the benefits subterranean hideouts offer, nuclear bunkers were designed to keep people in, rather than keeping invaders out. If the infection were somehow able to penetrate the facility, survivors could become trapped underground with a rapidly multiplying mob of the undead. On May 8th, 1902, the Mt. Pelee volcano erupted on the island of Martinique, killing an estimated 30,000-40,000 people in the town of Saint Pierre. Only a handful survived–a few lucky sailors in boats off the coast, and a local drunk who had been thrown in jail the night before: Ludger Sylbaris. His solitary confinement cell, a stone structure built partially into the ground, saved his life from scalding volcanic gasses and ash. Saint Pierre never recovered from the devastation, and today has a population of around 1000, but Sylbaris’ prison cell still stands. With a tiny window and one entrance, it could be a good place to hunker down during a zombie invasion. Pros: This structure has a few things going for it in terms of zombie defenses: it’s located on an island, it’s made of stone with only one entrance to fortify, and, perhaps most importantly, it’s one of the few structures in the world that has already proven its effectiveness at withstanding truly apocalyptic conditions. Cons: Mt. Pelee is still one of the world’s most active volcanos, so there is a chance that while waiting out the zombies, you would have to deal with an eruption. 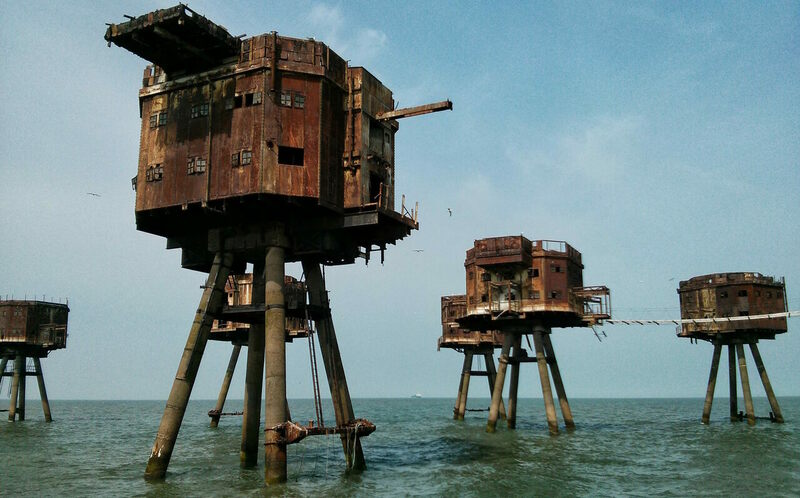 In the Thames Estuary sits an abandoned series of anti-aircraft towers built during World War II. Propped up on stilts high above the waterline and decommissioned in the 1950s, these structures are in serious disrepair, but could provide an almost perfect strategic refuge in the event of a zombie outbreak. In their current state, entering the sea forts is prohibited and possibly unsafe, but they could easily be fortified to provide protection and seclusion. Pros: Surrounded by water, which is arguably the best zombie deterrent, access to these raised structures is easy to control, and inhabitants would enjoy an unencumbered view of their surroundings. Cons: State of decay is the biggest issue here–housing a large group of survivors in such a decrepit building would be inadvisable. Besides dealing with a limited food supply, the only valid threat would be other desperate humans seeking to claim these forts for themselves. Carved into the sandstone along Highway 191 in Moab, Utah, this humbly named dwelling is actually a luxurious 5,000 square-foot home, complete with 14 rooms, a fireplace, and a relaxing bathtub. If your goal during the zombie apocalypse is to live as normal a lifestyle as possible, this “hole in the rock” might be the perfect place for you. Pros: At only 5,000 square feet, this abode is much smaller than many government-built bunkers, which makes it easier to secure and well suited to a small band of survivors. The Utah canyonlands are sparsely populated, and the people who do live there are known for their self-sufficiency. Cons: Its proximity to a highway isn’t ideal, and scarcity of food and water could become a problem. It doesn’t get much better than this. The Svans have been the gatekeepers of the Caucasus Mountains since the bronze age, when their ancestors battled to keep countless invading armies out. The threat of invasion never abated, and today their heavily fortified tower style homes still stand in the hilly landscape of present-day Georgia. The architectural formula is simple, but it works: every home in the Svaneti villages is surrounded with a protective wall and and a lookout tower, providing a perfect tactical combination of observation and defense. Pros: These structures have proven their efficacy at protecting a vulnerable territory from forces as varied as the Roman Legion and the Mongol armies—an invasion of flesh-eating undead? No problem. Cons: Impressive as it is that the towers have held up for thousands of years, the elements have certainly taken a toll. Additionally, the villages’ location in a rugged valley offers concealment but also reduces warning time in case of attack. While the Korowai Tribe of Papua are best known for a 60 Minutes segment that exposed them as “the last cannibals,” the tribe deserves more credit for their extraordinary architectural skills: their homes are built into the jungle canopy, up to 114 feet off the ground. When it comes to apocalyptic hideouts, this treetop town has a lot going for it: elevation, isolation, and the fact each house is accessible by a single notched pole that would be nearly impossible for a zombie to navigate. Pros: Isolation is an important feature of any hideout, and the Korowai Tribe excels in this area: it was completely removed from the outside world until first contacted by Dutch missionaries in the 1970s. 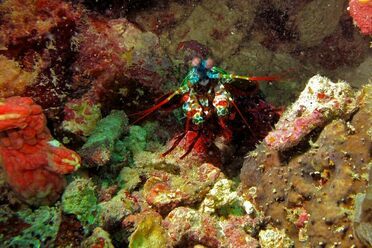 In addition, the tropical climate means year-round access to fresh fruit and vegetables. Cons: Snakes, spiders, and the small but ironic risk of being eaten by cannibals while hiding from zombies. Between 1969 and 1988, the United States Federal Reserve stored billions of shrink-wrapped dollars in a facility lined with 12-inch thick concrete walls, reinforced by steel, and buried nearly 4 feet underground. The bunker now resides under the National Audio Visual Conservation Center, storing a huge supply of archives including ultra-flammable nitrate film. The stash was preserved as a precautionary measure, to rehabilitate the dollar supply east of the Mississippi River in the event that the East Coast was demolished by a nuclear bomb. Before it was purchased in 1997 with the consent of Congress by the David and Lucile Packard Foundation, it was used as a “continuity of government” shelter, designed to house and feed 540 people for 30 days in case of a catastrophe—zombie or otherwise.